You can grow palms in Seattle. You can grow bananas in Seattle. You can, apparently, grow many more things in Seattle than most people would have imagined even a few years ago-at least, until a cold winter comes along! And that list also includes, you guessed it, the Proteas. Proteas are an intriguing group of plants that come primarily from the Southern Hemisphere: notably Australia, South Africa and Chile. The word "Protea" can refer specifically to the South African genus Protea, or to the entire family Proteaceae, as I am using it here. Embothrium coccineum in my garden, Olympia, Washington. Far the most important thing we can learn about Proteas is that they offer flowers in magnificent colors and bewildering shapes completely unlike anything else in the plant kingdom. Firecrackers, spiders, candles, toothbrushes, cones, flowers with beards-almost anything is possible in the Protea family! The flowers preserve very well "off the vine," and Protea cut flowers from specialist growers in California and New Zealand demand a pretty penny. Proteas remain rare in cultivation, but they have gradually been making their way north from Southern California over many years and are beginning to catch on in the Bay Area. While certainly not all Proteas will grow in Seattle, a few are now trickling into the Pacific Northwest. A few Proteas have been here for a while, finding California to be a bit hot for their liking. 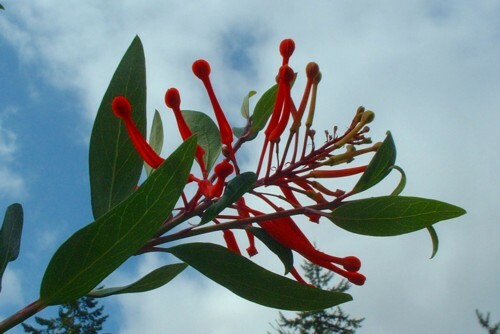 Perhaps the best known example of a Seattle Protea is the legendary Chilean Fire-Tree, Embothrium coccineum. A gawky, roughly columnar but quite irregular and nondescript tree out of bloom (though some forms, being semi-deciduous, have nice yellow fall color), it becomes one of the most spectacular of all flowering trees in the spring when it is covered with hundreds of orange-red, flame-like flower clusters. Native to a variety of habitats in the wild, it adapts pretty well to Seattle gardens, and it is sporadically available at local nurseries and plant sales. Gevuina avellana, Washington Park Arboretum, Seattle. Chile is home to at least two more interesting Proteas. Gevuina avellana has large, compound, evergreen leaves of outstanding texture, being thick and dark green with velvety brown undersides. Its white flowers are followed by a crop of large edible nuts not unlike macadamia nuts! In Seattle, it seems to grow as a shrub or tree depending on how exposed it is. Lomatia ferruginea, a showy plant with fern-like leaves and orange flowers, is also worth seeking out. Australia is home to many Proteas. While some genera consist entirely of hopelessly tender oddities, quite a few genera have representatives that will adapt quite well to the climate of the Pacific Northwest. A few of them hail from the windswept alpine heaths of Australia's highest mountains. Grevillea is the largest genus of Proteas and probably the most important for us in the Seattle area. Many species are known to be able to endure 10�F, some even lower, and numerous outstanding garden hybrids exist. Most will bloom for many months, sometimes even all year, and are hummingbird magnets even in the dead of winter. Perhaps the best known species is Grevillea robusta, a large tree with fern-like leaves and screaming orange flowers, but it is marginally hardy at best in Seattle and prone to winter dieback. One of the best for us is Grevillea victoriae, a felty-leaved thing with rusty red flower buds. It has proven very easy to grow and well adapted to our climate, even breezing through the landmark winter of December 1990. The form 'Murray Valley Queen' has larger clusters of very showy flowers, and 'Marshall's Seedling' is a very vigorous plant with smaller leaves and large flowers. 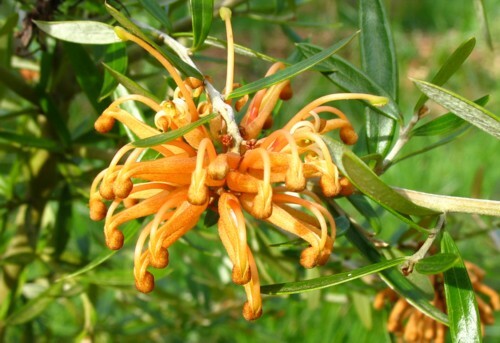 Grevillea miqueliana is similar, but with greener leaves and yellow or orange flowers. Grevillea 'Austraflora Fanfare' in my garden, Olympia, Washington. Some of the hardy Grevilleas have small, prickly leaves and could be mistaken for conifers when out of bloom-which isn't very often-until the bright orange, red, yellow, or pink flowers appear. All forms of Grevillea juniperina are hardy to our climate, including the yellow-flowered var. sulphurea and the vigorous 'Pink Pearl'. 'Canberra Gem' (sometimes sold as just 'Canberra') is also hardy. 'Noellii', common in California, is a little bit less hardy but has lived in my garden for seven years with no problems. 'Poorinda Constance', 'Poorinda Queen', 'Poorinda Elegans' and 'Austraflora Canterbury Gold' are spreading shrubs with a little bit larger leaves and a very long bloom period; these seem to be hardy for us, as are many forms of Grevillea rosmariniifolia and Grevillea lavandulacea. The most outstanding hardy Grevilleas have long inflorescences held in one plane like a giant toothbrush. These include Grevillea 'Austraflora Fanfare', a groundcover with lobed leaves and deep red flowers, 'Poorinda Royal Mantle', a very flat groundcover with variably lobed leaves and magenta flowers, Grevillea acanthifolia, a prickly-leaved shrub with long, purple flowers, and Grevillea x gaudicahudii, a natural hybrid similar to 'Austraflora Fanfare' but with shorter, wider leaves and inflorescences. Many species in this group should be fully hardy for the Seattle area, including Grevillea willisii, Grevillea barklyana, Grevillea scortechinii, Grevillea 'Bronze Rambler' and Grevillea laurifolia, but, alas, they remain nearly impossible to find. While many of the Grevillea banksii hybrids that are becoming popular in California may tempt Seattle gardeners, these plants, including 'Superb', 'Robyn Gordon' and others, are not very hardy at all and cannot be expected to survive a real winter. However, it is not out of the question that some Western Australian Grevilleas may grow here. This is worth considering since Western Australia has the same dry-summer, wet-winter weather pattern that we do, so anything from this region found to have adequate cold-hardiness should be very well adapted to Seattle. The Western Australian hybrid Grevillea 'White Wings' has done surprisingly well in my garden, easily breezing through winter cold and wet until the temperature dropped below 20�F. 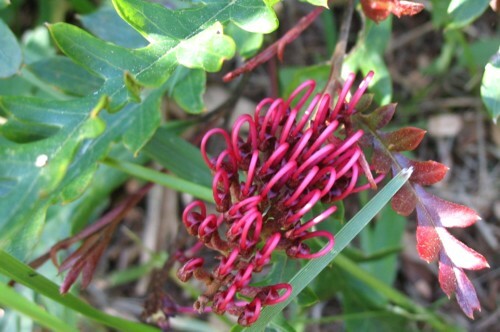 Thus far, most of these plants have been assumed to be tender, but few of these, including Grevillea deiseliana and Grevillea tetragonoloba have been known to endure 12�F without harm in eastern Australian gardens. Could these fabulous plants possibly be grown in the Seattle area? There's only one way to find out! Banksia spinulosa at the UCSC Aboretum. Another Australian Protea genus to attract much attention is Banksia. These are mostly shrubs and trees with tall, geometrical, cone-like inflorescences and, frequently, fantastically serrated, often saw-like leaves that look like something a child would draw. In general, it seems that Banksia species are a little bit less frost hardy than Grevilleas, but some species show promise. Probably the hardiest is the yellow flowered Banksia canei. Banksia serrata and Banksia spinulosa, with fat orange flowerheads and tall candle-like flowerheads respectively, are rather hardy. Banksia marginata and Banksia integrifolia are a little less hardy, and may die back when temperatures drop into the teens. I'm curious to try Banksia oreophila, a species native to Western Australia's highest mountains. Banksia repens and Banksia blechnifolia, also from Western Australia, have large l eaves and flowers and a prostrate habit; these are probably not hardy for us, realistically speaking, but one has to try. There are also a number of Banksia hybrids, a few of which may be worth attempting. Telopea is a small genus of Australian Proteas that greatly deserves attention. Coming from cool rainforests in eastern Australia, these upright shrubs show obvious affinity to Embothrium, but have darker red flowers in large, very showy terminal heads. Telopea speciosissima has the largest flowers, and is often grown commercially as a cut flower. While it is the most cold-tender species, it may still be just hardy enough for a sheltered Seattle garden. Telopea oreades (syn. Telopea mongaensis) has more open, darker flowers, and the Tasmanian Telopea truncata has very showy, compact flowers. It is the hardiest species, and a rare yellow-flowered form is known to exist. Numerous cultivars exist in Australia, most notably the white flowered 'Wirrimbirra White', but sadly few of these have made it to cultivation in the US. Lambertia formosa at the UCSC Aboretum. Australia has numerous other hardy Proteas of many forms and textures. Tasmania is home to many outstanding species, most of which remain extremely rare. 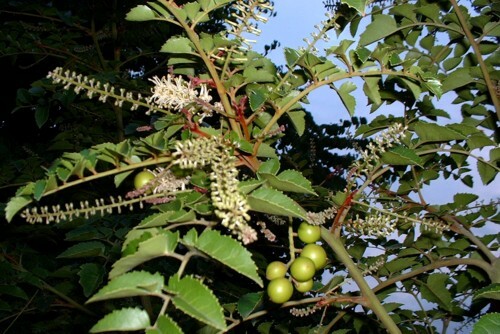 One exception is Lomatia myricoides, which is not impossible to find, but there are also Lomatia tinctoria and Lomatia polymorpha. Agastachys odorata, the white waratah, and Bellendena montana, mountain rocket, could make fabulous and hardy garden plants, as could Persoonia gunnii. A few white or cream flowered Orites and Hakea species, while not especially showy, are known to be hardy, including Orites diversifolia, Hakea microcarpa, Hakea lissosperma, Hakea nodosa, and Hakea epiglottis. 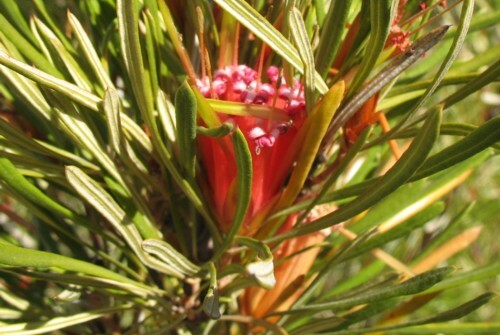 I must also mention two showy plants from eastern Australia that ought to be hardy, Lambertia formosa, a large shrub with showy, tubular orange flowers, and Isopogon formosus, an odd creature with deeply lobed leaves and cone-like, purple flowers. Sadly, the fabulous Stenocarpus and Alloxylon species, showy trees from Queensland with large red flowers, are cold-tender for us in Seattle. Probably the best known plants when people think of "Proteas" come from South Africa. The fabulous large cup-like and bearded terminal flowers belong to shrubs of the genus Protea. The best-known species for cut flowers is Protea cyanaroides, but it is not very cold-hardy. A better bet might be Protea venusta, with attractive red and white flowers, or the purple flowered Protea puncata. Protea grandiceps, Prtoea magnifica, Protea laufirolia and Protea aristata all have very showy flowers and some cold hardiness, and may be tried. Some very hardy and montane species include Protea subvestita, Protea roupelliae and the tree-like Protea caffra; however, these come from the wet-summer, dry-winter climate of the Drakensberg and may have problems with cold temperatures in combination with our winter rains. Hardy Protea species may also include a few odd plants like the prostrate Protea cryophila, which has huge, spoon-like leaves and creeps along the ground. Leucadendron 'Sylvan Red' at the UCSC Aboretum. Leucadendrons have cone-like flowers surrounded by showy colored bracts, which differ between male and female plants of the same species. These are usually not hard to find in the floral section of any grocery store as a cut flower. Many also have outstanding shiny foliage, including the silvery Leucadendron argenteum, which, alas, is quite cold-tender. Some of the hardiest species include Leucadendron sessile, Leucadendron pubescens, Leucadendron barkerae and Leucadendron salignum. Hybrids worth attempting include 'Pacific Sunset', 'Safari Sunset', 'Maui Sunset' and 'Pisa'. Leucospermum species are also tolerant of moisture, but unfortunately most are simply not hardy to very much frost. Called 'pincushion' plants in the trade, the flowers of many somewhat resemble a pincushion stuck full of pins, and, being held at the ends of the branches, are very showy. The best known of these is Leucospermum reflexum. Perhaps a little hardier are Leucospermum tottum and Leucospermum catherinae, but whether these are hardy enough for Seattle remains highly doubtful. A few very rare species come from the Drakensberg and are probably much hardier, but the only one I know of that is at all showy is the impossible-to-find L. saxosum. While a few more Protea genera occur in South Africa, they remain very rare in US cultivation. Perhaps Aulax pallasia or some species of Serruria may be found to have enough cold hardiness for the Seattle area. New Zealand has two native Proteas, Knightia excelsa and Toronia toru. Knightia, a fastigiate tree with serrated leaves and dark red flowers, is only slightly showy; and Toronia is an interesting but modest plant. Neither plant is cold-tolerant enough for long term success in Seattle. Most references state that Proteas require full sun; little water; and poor, infertile, sandy soils to perform well in cultivation. While this is true of many Proteas, I would put forth that this overgeneralization has resulted in the demise of some Proteas in gardens, especially in hot climates. This is a pity because most Proteas introduced to the Pacific Northwest come through California, especially through places like the UCSC Arboretum which continues to introduce and trial new species and cultivars. I have observed that some of the more moisture-loving and cool-climate Proteas at UCSC suffer from too hot and dry conditions and die off before they ever make it to cultivation in the Pacific Northwest-an occurrence that is most unfortunate for Seattle gardeners, and will probably continue until one of our major botanic gardens takes an interest in Proteas. Protea species at the UCSC Aboretum. I would classify Proteas loosely into three types: those that require poor, sandy soils and full sun; those from rainforests that prefer richer soil and more moisture, and will tolerate some shade; and those that are able to adapt to a variety of soils, watering regimes, and degrees of exposure in the garden. While the majority of Proteas belong to the first type, many of the cold hardier species fall into one of the latter two categories, especially those from Chile and the moist forests of eastern Australia. Many of the hardy Grevilleas, for example, are quite adaptable and will grow on many soils, thriving on heavy clay in my garden, except for the toothbrush-flowered types which require sharp drainage. Lomatia and Gevuina are essentially rainforest plants but they will adapt somewhat to more exposed conditions in gardens. In general, Banksias and most Western Australian and South African Proteas require poor, sandy soils with excellent drainage. 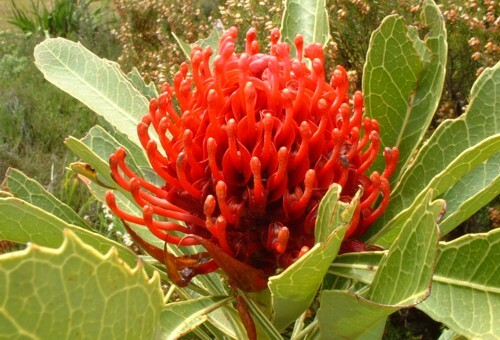 Western Australian Proteas will resent summer water, but others will respond to careful summer watering, the frequency depending on the species. Perhaps the most important thing to remember about Protea culture is that high levels of phosphorous in the soil are toxic to many of them, and can kill them. Even the amount of phosphorus in balanced fertilizer presents a great risk and should not be used, especially for potted plants. Fortunately, Proteas are very undemanding in their nutrient needs, and generally light applications of organic sources of nitrogen are all that is needed. (Some species may also respond to heavier applications of high nitrogen fertilizer, but only very-slow-release fertilizers should be used.) Proteas have a network of very fine roots called Proteoid roots, which are able to draw nutrients from very poor, infertile soils. This is why they are very sensitive to overfertilization, unless they have been fertilized heavily all their lives and consequently fail to develop many proteoid roots. The fine roots also resent root disturbance, so Proteas should be potted on or planted out taking great care not to disturb them, and once they are in the ground, they should be left alone. Protea cold-hardiness depends on a number of factors. While advective freezes or "arctic blasts" such as those we experience are foreign to the Southern Hemispere, some Proteas are surprisingly tenacious. A few plants such as Embothrium coccineum and Grevillea victoriae have proven this over the long term, and I don't doubt that many more will in the future. Gardeners can do a few things to ensure the best possible chance of their plant enduring a cold winter. To begin with, since most plants gain hardiness with age, don't start with too small of a plant. Start with at least a 1-gallon plant, perhaps a 2 or 3-gallon. (On the other hand, starting with a plant in a large pot may result in problems with soil incompatibility.) Plant it in a soil and situation where it will be happy and can establish quickly. Unless it is an exceptionally tough species or you are willing to risk it, plant it in the spring so it will have an entire growing season to establish before winter comes. Once the plant is established, I strongly believe that withholding water for Proteas, especially in late summer and on heavier soils, enables the plant to be tougher and hardier to winter cold. Grevillea 'Poorinda Queen' in my garden, Olympia, Washington. Complicating matters further, a single species may exhibit considerable variation in hardiness, depending on where it originated. Thus, it is often worth trying multiple forms and collections of a single species. South African Proteas admittedly do not have a great track record for cold hardiness, and are generally the most difficult to keep through the winter in a maritime climate. While certain species such as Protea subvestita and Protea dracomontana have lived through winters in Denver; in general, the South African Proteas are not quite as amenable to the climate of Seattle. Many seem to require a certain quota of winter sunshine that Seattle just can't meet, or they suffer from the combination of repeated or prolonged frosts and too much winter moisture. However, some of these plants are still with attempting, with a degree of caution. I have more optimism about the Leucadendron species and hybrids, some of which seem to be more tolerant of moisture and a little bit less fussy about drainage than other South African Proteas. Many Proteas, if they freeze to the ground, have the ability to regrow from a basal lignotuber (a.k.a. the "stump"), provided they are happy and well established. This is an adaptation to the frequent occurrence of brush fires in the wild, which destroy the top of the plant at regular intervals. Nearly all Banksias and Telopeas, and the majority of South African Proteas, have this ability. Many of the Grevilleas, however, do not, and may be killed outright from severe cold. Proteas are generally care-free once established and growing happily. They seldom experience problems with pests and diseases. However, root rots can be a problem if drainage is not adequate, Leucospermum being especially susceptible to phythophthora. Generally little pruning is needed, but the occasional haircut can make the plants appear tidier. Some of the more rangy Grevilleas can be cut back rather hard (but not right to the ground) to rejuvenate them, or clipped back annually to encourage dense growth. Telopea speciocissima, Pistol River, Oregon. Most Proteas are propagated from cuttings or seed. In Australia and New Zealand, some are also grafted, but I think this technique will be less useful for us in the Pacific Northwest. Generally, the South African Proteas are grown from seed, with the exception of named cultivars, which are grown from cuttings, and certain species that root easily. Grevilleas are generally grown from cuttings-this presents a barrier to the introduction of new species and cultivars into the United States, since it is difficult to import entire plants or cuttings into the country; however, some can also be grown from seed. 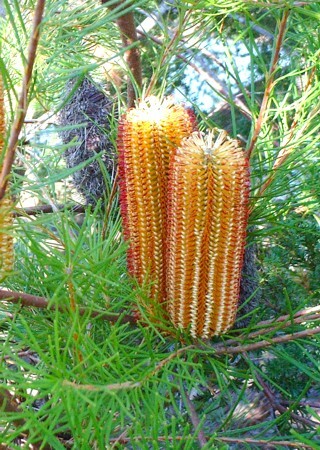 Banksias are often grown from seed; many are also propagated from cuttings. Telopea and Embothrium are most commonly grown from seed, though cuttings can be somewhat successful as well. As I have hinted, just finding the desired plants can be a challenge in itself. 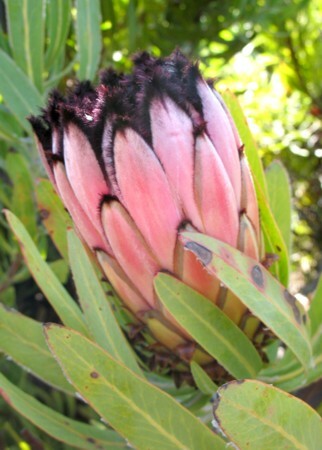 Many wholesale nurseries avoid growing Proteas because of their different cultural needs. Many retail nurseries do not know that such a wide range of Proteas show promise for our region; or if they do, they can't source them easily, or don't expect plants to move since most customers prefer the tried-and-true. Occasionally I see the odd Protea or two show up at some of the Seattle area's larger nurseries, especially Wells-Medina. Colvos Creek usually offers a few hardy species, and of course I have a few for sale, and more in production at my nursery, The Desert Northwest. Plant sales such as the NPA sale and Arboretum sale may also be a place to look. 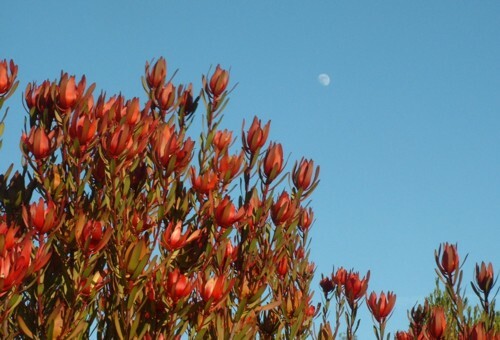 The best bet for the serious Protea enthusiast is to drive to California and shop from the UCSC Arboretum plant shop, and Sierra Azul Nursery in Watsonville. Proteas may be scarce in Seattle now, but they offer some of the most exciting future possibilities for gardeners wishing to try something different. Now it is up to you to enter uncharted waters, to go beyond the bananas and palms, and discover and experiment with Proteas. Sure, they will grow in Seattle-we just have to find out how many!